One of my favorite food bloggers, jenieats.com, has said once if not a dozen times that the directions and amounts for recipes she makes from memory are always a guess. She adjusts as she cooks, and those are the things that are in a more frequent rotation so she doesn’t note precise amounts. 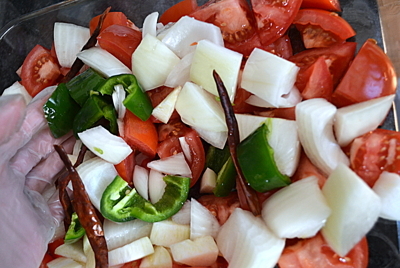 This is how I cook a lot, too, and most especially in the case of my salsa. I started making salsa this way 2 years ago when we belonged to a CSA (community supported agriculture) and had shares in a vegetable box once every-other week. 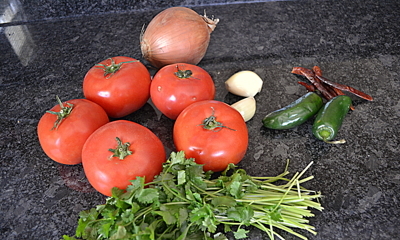 Prior to that, I only made salsa with my mother-in-law’s guidelines and with tomatillos, which is really good as well, but I was looking for a way to use all the gorgeous red tomatoes in the box we were receiving. So, use this recipe as a guide. You can adjust the amounts of ingredients based on preference of heat, garlic, or acidity. If you don’t like cilantro (I won’t judge you, but it’s salsa, so…. ), omit it. Try another herb like oregano to see if that gives you a flavor profile you like. Anyhow, my point is, if I can nail a salsa (which is a staple in our home and always in the fridge and freezer), you can, too. 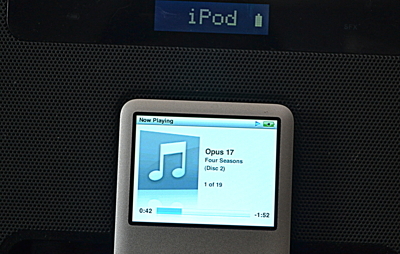 Playlist (varies): This time around The Four Seasons (wait ’till you see what I make when I have Maná on my playlist). Also note: these photos were snapped in the dead of Chicago winter. While I prefer vegetables from a farm or farmers’ market, you can still pull of fresh flavors if you put in a tiny bit of effort. Tiny. Preheat oven to 425 degrees. Turn the tomatoes upside-down and lightly score them with a knife–I usually just do an “X.” Set a pot to boil and get an ice bath ready. 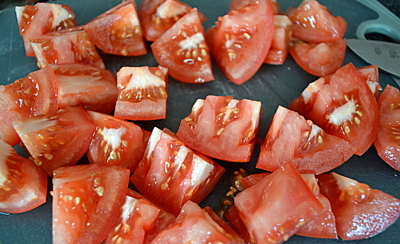 Flash boil the tomatoes for about 45-60 seconds then put directly in the ice bath. Peel the skins and get them cut. Place all ingredients except cilantro and lime juice into a 13X9 glass baking dish (or metal if that’s all you’ve got). Using your hands (with latex gloves-trust me), mix everything so that the oil is uniformly distributed and the veggies are lying in an pretty even layer. Take my word on the gloves; once the peppers were so strong that the skin on my hands were painfully burning. IF you decide not to heed my advice, a good trick for relieving that pain is to rub olive oil on your hands; it draws the oils from the pepper out and really helps a lot. And that is why I now wear gloves: cheaper and less painful. Put in the oven and set your timer for 15 minutes. When you’ve reached the 15-minute mark, stir again, as the top layer will have some charring and you want that to reach the stuff on the bottom of the pan, too. Set timer for another 15 and continue until all ingredients have a roasted look to them. 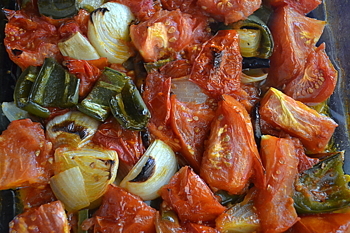 Remove from the oven and, while things cool off a bit, prepare the food processor. I’ve mentioned before that I have a rather small food processor, so if you’re in the same gravy boat as I am, get a large bowl so you can empty the batches of blended salsa and keep plugging away. I am typically only needing to do 3 rounds for this size of a batch. 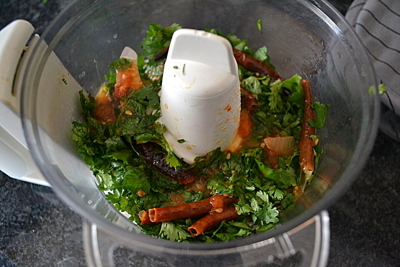 Anyhow, by large spoonfuls the roasted vegetables and for each blend-through, add a handful of cilantro to be blended with it. You will use the liquid so no need to drain off. 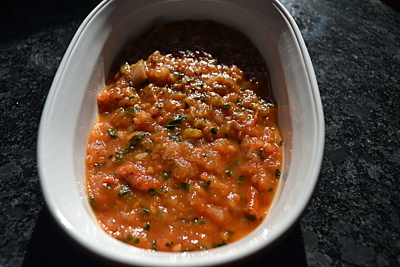 Once everything has been processed and poured into a bowl, stir well and let cool completely. Salt to taste. Add lime juice if you like. Freeze portions to save for later if you won’t use this much at once (pretty much the case unless you’re hosting a large Superbowl party). Thanks, Holly. Great idea for a Father’s Day BBQ–good thinking! I’ve only ever roasted tomatillos for salsa. I’m trying it your way next time! I still love the tomatillo salsa, but this one is nice for a different flavor. Tell me how it turns out when you give it a try!